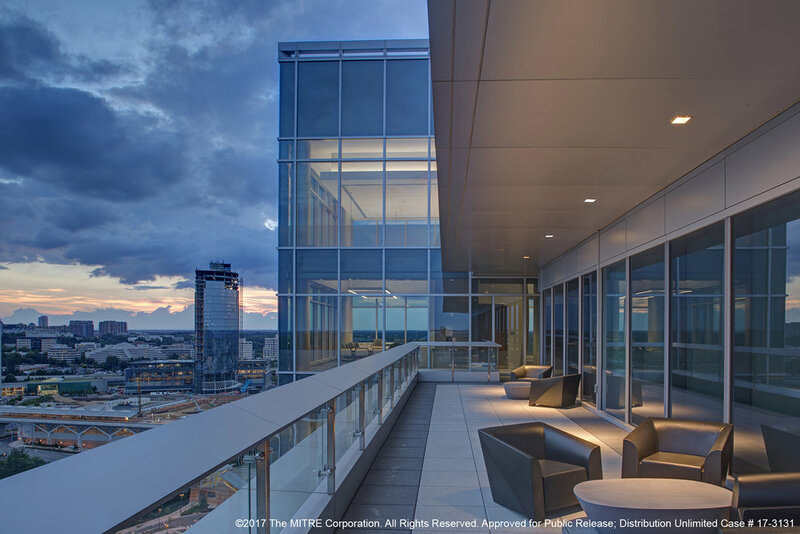 The MITRE 4 building is a state-of-the-art, 340,000 square foot, 225-foot, high-rise accommodating office, R&D lab, and amenity spaces including a coffee shop, lecture hall, a conference center, and 4 levels of below-grade parking. SKA provided architectural and engineering services for the entire project, base building and interiors. The MITRE Corporation is an independent, not-for-profit corporation that provides scientific research and development support to the Government. MITRE operates multiple Federally Funded Research and Development Centers (FFRDC) by providing innovative, practical solutions for some of our nation’s most critical challenges in defense and intelligence, aviation, civil systems, homeland security, the judiciary, cyber and healthcare. MITRE’s sponsors include the DoD, DHS, FAA, HLS, HHS, NIST, DOT, DOJ, Treasury Department and Veterans Affairs. The MITRE 4 Building is a Research and Development facility incorporating unique, leading-edge lab environments for a highly academic, technically sophisticated community. The project was one of the first projects to be approved under the new Planned Tysons Corner Zone allowing significant additional densities and height. The Building was designed as a response to the site, the new zoning, as well as the unique functions that the building would house. Adjacent to a new Metro station the tower serves as a marker and gateway to the campus. The building is sculpted to create opportunities to connect the inhabitants with each other, the exterior, the rest of the campus, and the community beyond. The creation of a variety of spaces animates and inspires the design of this building. 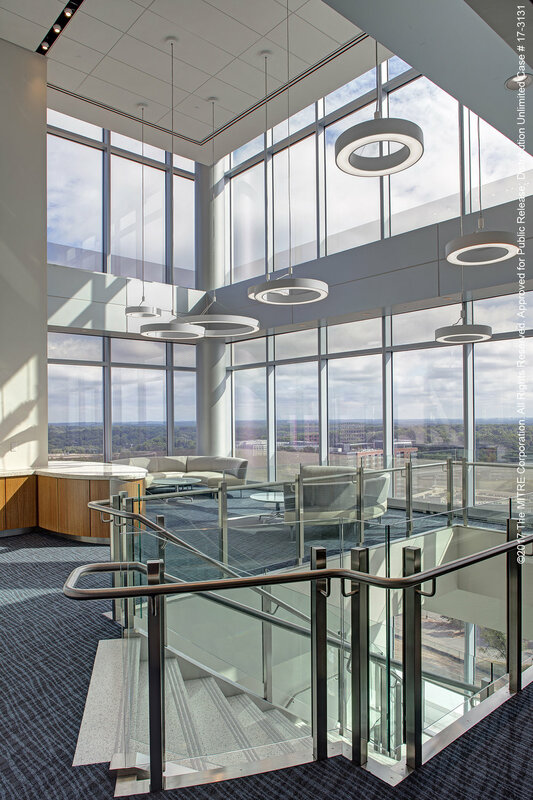 A tower element encloses conference rooms on each floor, while a lecture hall wing extends beyond the main tower providing opportunities for large assembly and collaboration functions. Rooftop terraces provide exterior work and collaboration opportunities. The building houses shared community amenity spaces on the lower three floors, two dedicated Lab floors, and office functions. The office floors provide individual offices for heads-down quiet work, as well as dedicated department space to support collaborative project work. 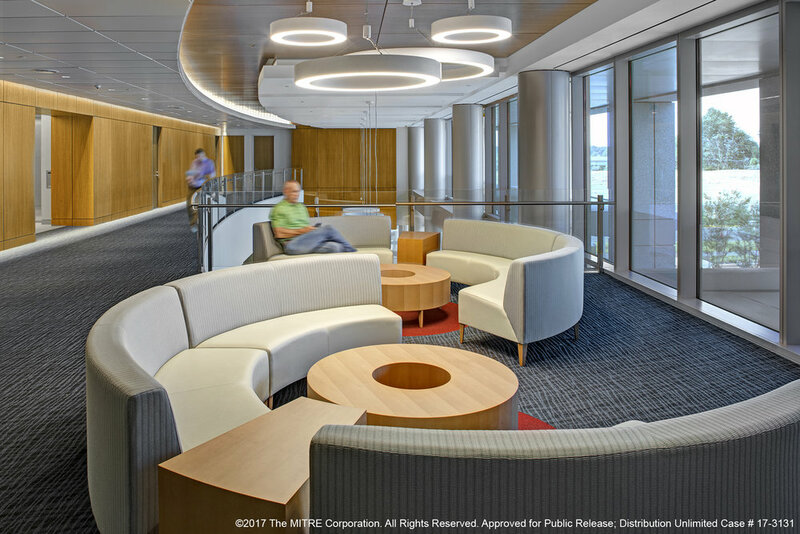 The MITRE 4 Building project achieved USGBC LEED Gold Certification. The design features environmentally sensitive initiatives including a cistern for stormwater retention and reuse, high performance skin systems, a high efficiency central mechanical plant, locally sourced materials, recycled content materials, low-flow plumbing fixtures, high-efficiency irrigation, and facilities for alternative fuel vehicles.